The thing that makes Isaac Clarke so great is how flamin’ ordinary he really is. You see, a lot of heroes tend to be these one-of-a-kind characters with skills and abilities above and beyond those around them. A lot of video games are made on the premise of being someone or some group’s last hope for no other reason than being unique during a time of great need. For example, the Master Chief from Halo was the last Spartan. 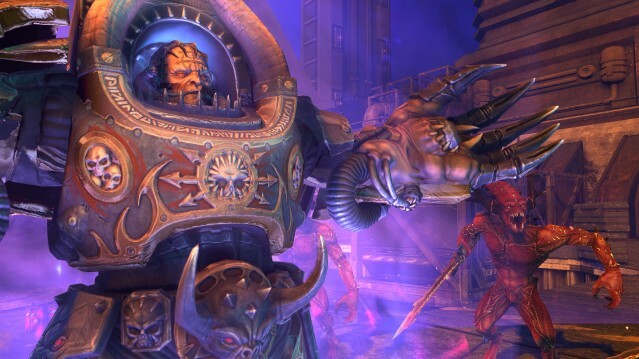 Captain Titus of Space Marine had some strange resistance to the power’s of the warp which helped him, on top of being one of the rarest soldiers the Imperium has to offer. In Skyrim, your character is dragon-born. In the Castlevania series, the Belmont clan has a long standing tradition of opposing vampires while Alucard is Dracula’s only son. And many main characters from the Final Fantasy series, such as Cloud Strife, Zidane Tribal and Terra Branford, all are incredibly unique and rare for a variety of reasons. They can do it because no one else can. 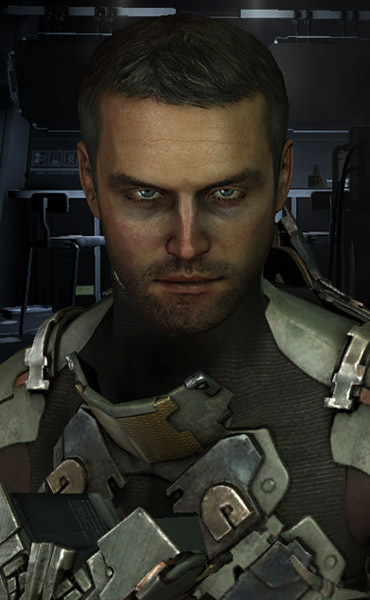 But in Dead Space, there’s nothing super unusual about Isaac Clarke. Oh sure, he suffers from dementia from exposure to the marker (which is more a curse than blessing), but he’s not the only one and probably won’t be the last either. He stands up to the Necromorphs, but he’s not alone there. Nor is he the only one who can destroy the marker, as I’m sure both the Unitologists and EarthGov can. Only they choose not too. Nope. Isaac Clarke’s quest is a bloody one of self-discovery and healing, but its overall effect on the world around him is fairly minimal, despite how huge it must have seemed at the moment of completion to the player. The player only explores the world around the eyes of Isaac in the main Dead Space series. We only ever see this world of political intrigue and struggle through the eyes of Isaac, whose condition made him highly useful, but not irreplaceable. Indeed, Isaac is caught up in that long going struggle between church and state. Much like the Dark Ages of Europe where the popes and kings sometimes allied and sometimes struggled against one another. Neither side is particularly interested in Isaac’s welfare. Today, whether the conflict of church and state continues is a matter of personal opinion. But just about everyone knows what it’s like to be sandwiched between two power hungry giants in some shape or form, be them political, economic, religious or otherwise. Also, Isaac is a nerd. Even without super powers or unusually beneficial aspects, gruff soldiers are a common enough hero type. The Master Chief, Marcus Fenix of Gears of War, Commander Shepard of Mass Effect. All these games make the player feel remarkably qualified to save the world. Not so with Isaac, who carries on a growing tradition similar to Gordon Freeman of Half Life. He’s not a soldier, he’s bloody tech support. He’s the guy you call when your hard drive crashed or you need permission to install the latest version of an application, or when your engine is on the fritz. His weapons? Mostly modified mining tools. His mission? Fix the damn engine before we get charred falling into the atmosphere. And like many nerds, Isaac Clarke doesn’t seem to have much luck with the love life either. I just don’t see a happy ending for him. Like, ever. The first game was a sick joke on the man, when he find sout that his girlfriend, who he thought was alive and helping him, was actually dead. And the second game, he wrestles with dementia as the memory of long dead Nicole tries to kill him. Oh and the new girl? Poor gal loses her eye babysitting a guy for Isaac. What a lousy first date. So yeah. 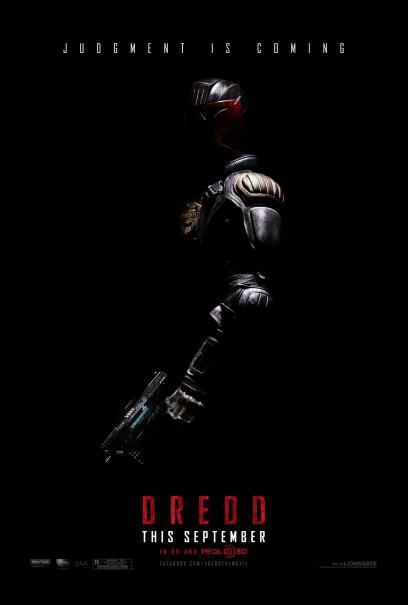 It’s a shame that Dead Space 3 maybe the last we see of Isaac Clarke. It’s generally acceptable that we have to move on from characters after a while, after their story is told and the challenge has been overcome. But I’ll bet that the archetype of Clarke will endure. It’ll be thought on, reinvented and introduced in future games, books and movies. I’m sure Dead Space 3 will do fine for itself. It’ll be a good game that is remembered, but not the break out smash hit that the series never was. At least for now. Sometimes, today’s moderate successes are tomorrow’s greatest hits. I'll get my chance to play. Some day. So it’s confession time on GOW3-day. I’ve never played any of the Gears of War series. I’ve always wanted too, but never have. There are a few reasons for this. First, I’m a PC gamer. I just don’t have the money to shell out for an XBox 360 when the majority of games I want come to PC. Yeah, Microsoft had a few titles I wanted to try, but the PC had more. That, and I use my PC for work as well as play. 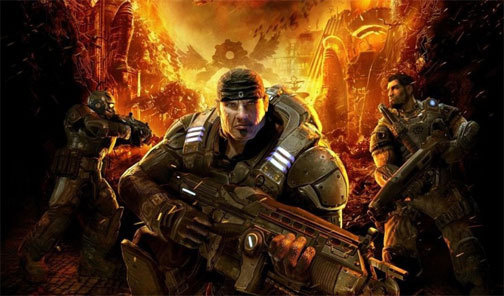 This is a half excuse however, because the original Gears of War came to PC, eventually. But GOW2 didn’t and GOW3 probably won’t either. The second reason I’ve held back is because Gears of War has always struck me as a series that was going to end. It’s the story of one major conflict. Conflicts always come to some conclusion. They did in the original three Star Wars movies. And when they end, I’m left hungering for more. It’s rough to hook a fan on fast paced combat and co-operative play and then tell them that the good times are over. But what about the Halo series? I hear you. Yes, it’s being continued. And I loved the first Halo. The second one lost me when they made it shorter and the weapons more generic and less interesting. The developers felt like they tried too hard revamping the graphic engine instead of focusing on level designs and gameplay. The first Halo was something special and unique at the time. Then they tried too hard to commercialize it and to make it generic, with too much focus on the multiplayer. It stop being an awe inspiring piece of sci fi themed game play and instead became the thrill of frat boys and their frag parties. I regarded Gears of War from a distance. I read the Wikipedia entries and watched videos. It seemed different. It did not seem to betray its core integrity. It seemed to have some story to tell that it never lost focus of. From the outside, I noticed that details changed but the central concepts didn’t. It seems as good a time as any to jump in. I’ll go hunting for the PC version of the original game and see if I can’t catch up before long. Like a book everyone but me has read. Expect a few oil tankers worth of blood. 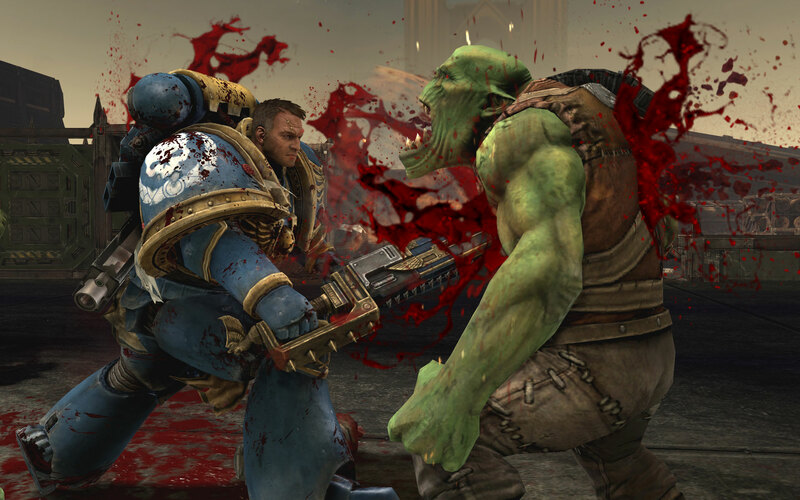 For some time now, THQ has been teasing and teasing Warhammer fans with the chance to step into the shoes of a Space Marine. We’ve seen all manner of trailers, talk and ideas spun about what we’re going to get. But this month, Games Workshop fans finally got a reward for their faith. The game is good. Not perfect, but damn good. Let’s start with what we see. The game is a marvel, the characters detailed and amazing to behold. There are these tiny details, ranging from the streaming purity seals to the variety of armor components. The scars across their faces and especially Captain Titus, whose hair is parted by a nice scalp wound. Part of me wants to point out that there seem to be a general lack of facial expressions before I remind myself that Space Marines, being the perfect soldiers, are effectively psychopaths. Why they would need to smile is not even worth asking. The levels are huge, but are completely dominated with Imperial iconography. THQ has gone above and beyond to truly and fully bring the intellectual property of Games Workshop to the home screen. They’ve done this very well before in the Dawn of War series and even when viewing the world from the eyes of a single Astartes, they do not stop. Speaking of levels, I noticed two flaws. The first is technical and the problem is probably unique only to my situation. My experience with the game comes from Windows XP SP3 on a solid machine. Compared to the other platform options, which include XBox 360, Playstation 3 and Windows 7 PCs, this is well on the lower end. Every time the screen shakes considerably, a black skeleton of the architecture can be seen. I doubt others will experience this. The second problem is the lack of choices. I am a PC gamer, my time on the console is behind me. Many of the games I play, like Fallout, tend to spoil me with the options and choices of destinations being at my discretion. To its credit, Space Marine does a bang up job of guiding the player to the next objective by pointing them out. You do not spend an hour looking for some switch to activate a bridge, like you did in the second stage of the original Halo. Yes, I still remember that. But it doesn’t give you any paths to choose from. I’m sure fans will rise to Space Marine‘s defense regarding this, but I think even they will agree they would like to see such choices in future installments. "Come, join Chaos. We have tacos." The game play is solid, successfully combining hack and slash melee action with cool and composed gun battles. Many a times I’ve charged into the fray, before pulling back to pop the heads of a few Ork Shoota Boyz with my Stalker pattern Bolter. I was very worried about the game folding into a pattern of wash, rinse and repeat, but the weapon and enemy varieties have avoided that boring problem. Though I was glad to finally see Chaos when they popped up. Speaking of Chaos, I have to apologize to my readers. My earlier insinuation of Chaos being the Iron Warriors was wrong. I was misled by the color scheme and emblem designs, but the Chaos Space Marines belong to some unusual chapter called the Chosen of Nemeroth. It was my fault for spreading misinformation. Anyway, besides fighting the other object is simply staying alive. The first survival metric is against your armor’s power rating, and the second is your health. Armor recovers on its own if you stay out of combat. Health doesn’t in single player. Captain Titus recovers health by either unleashing fury or delivering executions. Executions are amazing to watch, but you’re very vulnerable while performing them. In multiplayer, players recover their health as they do their shields, but it takes a little longer. The single player game has enough content to merit at least a replay. Beside the list of achievements and challenges to attempt, there are also servo-skulls scattered through the stages to find and collect. The medium difficult has thus far proven challenging enough, but I will want to try my hand at the hard setting. But the multiplayer is where it’s at. THQ knew exactly how to rope players in with an addictive, reward based leveling system. There are 41 levels to earn, and perks and equipment are unlocked as you do so. These perks can start to give significant benefits to players. For new guys, this can be discouraging, but THQ thought ahead. When you die, you can “copy the loadout” of the guy who killed you for a single life when you respawn. This lets you fight on equal terms for much of the game if you desire.